"Lava flow" redirects here. For the programming anti-pattern, see Lava flow (programming). For other uses, see Lava (disambiguation). Explosive eruptions produce a mixture of volcanic ash and other fragments called tephra, rather than lava flows. The word lava comes from Italian, and is probably derived from the Latin word labes which means a fall or slide. The first use in connection with extruded magma (molten rock below the Earth's surface) was apparently in a short account written by Francesco Serao on the eruption of Vesuvius in 1737. Serao described "a flow of fiery lava" as an analogy to the flow of water and mud down the flanks of the volcano following heavy rain. Igneous rocks, which form lava flows when erupted, can be classified into three chemical types: felsic, intermediate, and mafic (four if one includes the super-heated ultramafic). These classes are primarily chemical, however, the chemistry of lava also tends to correlate with the magma temperature, its viscosity and its mode of eruption. Ultramafic lavas such as komatiite and highly magnesian magmas that form boninite take the composition and temperatures of eruptions to the extreme. Komatiites contain over 18% magnesium oxide, and are thought to have erupted at temperatures of 1,600 °C (2,910 °F). At this temperature there is no polymerization of the mineral compounds, creating a highly mobile liquid. Most if not all ultramafic lavas are no younger than the Proterozoic, with a few ultramafic magmas known from the Phanerozoic. No modern komatiite lavas are known, as the Earth's mantle has cooled too much to produce highly magnesian magmas. Lava flow speeds vary based primarily on viscosity and slope. In general, lava flows slowly (0.25 mph), with maximum speeds between 6–30 mph on steep slopes. An exceptional speed of 20–60 mph was recorded following the collapse of a lava lake at Mount Nyiragongo. Discriminating between an intrusive sill and a lava flow in ancient rock sequences can be difficult. However, some sills do not usually have brecciated margins, and may show a weak metamorphic aureole on both the upper and lower surface, whereas a lava will only bake the substrate beneath it. However, it is often difficult in practice to identify these metamorphic phenomena because they are usually weak and restricted in size. Peperitic sills, intruded into wet sedimentary rocks, commonly do not bake upper margins and have upper and lower autobreccias, closely similar to lavas. The following three subsections are about the types of lava flow. For the Polynesian name for the brightest star, see Sirius. For the sculpture of a god from the Pacific island of Rurutu, see Statue of A'a from Rurutu. The word is also spelled aa, aʻa, ʻaʻa, and a-aa, and pronounced /ˈɑː(ʔ)ɑː/. It originates from Hawaiian where it is pronounced [ʔəˈʔaː], meaning "stony rough lava", but also to "burn" or "blaze". 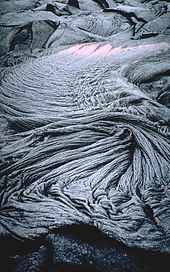 Pāhoehoe (/pəˈhoʊiˈhoʊi/ or /pɑːˈhoʊeɪhoʊeɪ/; from Hawaiian [paːˈhoweˈhowe], meaning "smooth, unbroken lava"), also spelled pahoehoe, is basaltic lava that has a smooth, billowy, undulating, or ropy surface. These surface features are due to the movement of very fluid lava under a congealing surface crust. The Hawaiian word was introduced as a technical term in geology by Clarence Dutton. On the Earth, most lava flows are less than 10 km (6.2 mi) long, but some pāhoehoe flows are more than 50 km (31 mi) long. Arenal Volcano, Costa Rica, is a stratovolcano. Diverting a lava flow is extremely difficult, but it can be accomplished in some circumstances, as was once partially achieved in Vestmannaeyjar, Iceland. Lava can easily destroy entire towns. This picture shows one of over 100 houses destroyed by the lava flow in Kalapana, Hawaii, United States, in 1990. Kapoho, Hawaii was largely inundated by lava in June 2018, with its subdivision Vacationland Hawaii being completely destroyed. Laze (geology), acid rains and air pollution arising from steam explosions and large plume clouds containing extremely acid condensate that occur when molten lava flows enter oceans. Vog, volcanic smog originating from volcanic vents. ^ Pinkerton, H.; Bagdassarov, N. (2004). "Transient phenomena in vesicular lava flows based on laboratory experiments with analogue materials". Journal of Volcanology and Geothermal Research. 132 (2–3): 115–136. doi:10.1016/s0377-0273(03)00341-x. ^ "Rheological properties of basaltic lavas at sub-liquidus temperatures: laboratory and field measurements on lavas from Mount Etna". cat.inist.fr. Retrieved 19 June 2008. ^ "Lava". Merriam-Webster Online Dictionary. 2012-08-31. Retrieved 8 December 2013. ^ "Lava". Dictionary.reference.com. 1994-12-07. Retrieved 8 December 2013. ^ "Vesuvius Erupts, 1738". Lindahall.org. Retrieved 21 October 2015. ^ a b Harlov, D.E. ; et al. (2002). "Apatite–monazite relations in the Kiirunavaara magnetite–apatite ore, northern Sweden". Chemical Geology. 191 (1–3): 47–72. doi:10.1016/s0009-2541(02)00148-1. ^ a b Guijón, R.; Henríquez, F.; Naranjo, J.A. (2011). "Geological, Geographical and Legal Considerations for the Conservation of Unique Iron Oxide and Sulphur Flows at El Laco and Lastarria Volcanic Complexes, Central Andes, Northern Chile". Geoheritage. 3 (4): 99–315. doi:10.1007/s12371-011-0045-x. ^ "Lava Flows" (PDF). UMass Department of Geosciences. University of Massachusetts Amherst. 11 February 2004. p. 19. Retrieved 5 June 2018. ^ McGounis-Mark, Peter. "Radar Studies of Lava Flows". Volcanic Features of Hawaii and Other Worlds. Lunar and Planetary Institute. Retrieved 18 March 2017. ^ "Types and Processes Gallery: Lava Flows". Global Volcanism Program. Smithsonian Institution. 2013. Retrieved 1 December 2015. ^ a b Klemetti, Erik. "Stunning Lava Fountains From Italy's Etna". Wired.com. Retrieved 2013-12-08. ^ "ERTH15: Most Significant Eruptions at Mt. Vesuvius". Quakeinfo.ucsd.edu. Archived from the original on 2013-01-16. Retrieved 2013-12-08. ^ Sonstroem, Eric (14 September 2010). "Vestmannaeyjar, The Town That Fought A Volcano And Won". indianapublicmedia.org. Indiana Public Media. Retrieved 24 November 2017. ^ "Article – Our Volcanic History by Gladys Flanders". Vhca.info. 1959-11-15. Retrieved 2013-12-08. ^ "Tourist attractions of Albay Province, Philippines". Nscb.gov.ph. Archived from the original on 2017-12-22. Retrieved 2013-12-08. ^ Bonaccorso, A.; et al., eds. (2004). Mount Etna:Volcano Laboratory. Washington D.C.: American Geophysical Union (Geophysical Monograph 143). p. 3. ISBN 978-0-87590-408-5. ^ "Global Volcanism Program - Nyiragongo". volcano.si.edu. ^ Thomas, Pierre (23 June 2008). "Église et gendarmerie envahies mais non détruites par la coulée d'avril 1977 de Piton Sainte Rose, île de La Réunion". Planet Terre (in French). ENS de Lyon. Retrieved 26 May 2018. "Lava" . Encyclopædia Britannica. 16 (11th ed.). 1911. pp. 289–290. 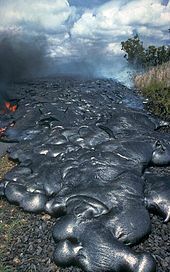 Look up lava, aa, or pahoehoe in Wiktionary, the free dictionary. Wikimedia Commons has media related to lava.